Hahaha! 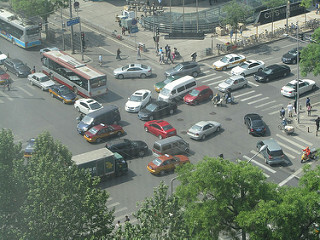 His post is an amazing one on traffic in Beijing. This is a little similar to Bangkok, Thailand where there is massive jams. Quite a nightmare even if you're taking cab. What's the best way to get around then? I think you don't really appreciate the humor unless you've been either a driver and/or pedestrian in Beijing. The Left Turn explained by Henry B back in 2007 sadly still applies today. After returning to US from my 2 years in Beijing, my muscle memory is still traumatized by this chaos as gracious yielding drivers in US are puzzled at my reluctance at the cross walk.